With the international break around the corner, Inter have one last showdown before the break, and it’s at the Stadio Atleti Azzurri d’Italia in Bergamo against Gasperini’s Atalanta. Inter are enjoying a run of 7 straight victories, Atalanta have 3 wins in their last 3 games. Games at Bergamo are always tricky with Inter winless in their last 3 trips. However, things might be a little different now because of the composition and form of the team. Inter have had 9 different scorers in the league. They have scored 21 goals, the second highest scoring team in the Serie A. Mauro Icardi, who was rested in the last game, has hit 6 goals in his last 4 Serie A matches. Inter have scored in each of their previous 7 games, including 8 goals in their last 2 outings. Just on two occasions have Inter failed to find the back of the net this season. Joao Mario has 2 assists in his only 2 games this season and has created 2 key passes per game, only Vrsaljko have more with 2.2. Atalanta have scored 19 goals from 18.1 shots per game, averaging 1.7 goals per game. Papu Gomez, Ilicic and Rigoni are the team’s leading scorers with 3 goals. Inter can boast of having the strongest defence in Europe’s top five leagues with just 6 goals conceded after 11 games. The Nerazzurri wall hasn’t been penetrated in the last 270 minutes of league football, and adding to this, they have kept 6 clean sheets in total. They are highly disciplined and organized: least number of cards in the league with 19 yellow cards and 0 red cards, and also they are one of the three sides together with Juve & Bologna who are yet to concede a goal from a set piece. 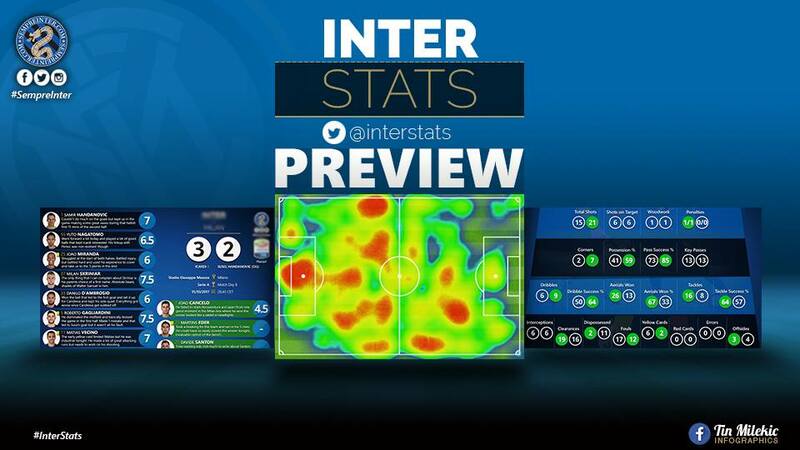 Inter have average 15.1 tackles per game and 9.2 interceptions per game: Brozovic has executed 3.2 tackles per game while Miranda has intercepted 2.2 balls per game. Atalanta have conceded 13 goals. They have an average of 15.5 tackles and 13.8 interceptions per game respectively. José Luis Palomino has the 2nd best interceptions per game in the league with 2.9. Marcelo Brozovic wears the crown of the best passer in Italy with 84.5 average passes per game while Milan Skriniar has the best pass ratio with 93.7%. Inter have made 495 short passes per game and 58 long balls per game with 31 crosses per game and 1 through pass per game. They have also an average of 56.1% ball possession and 85.9% pass accuracy. Atalanta are the 3rd best team, after Juve & Inter, in terms of possession with 55.6% and have 83.1% pass accuracy with Remo Frueler the safest passer at 88.6%. Brozovic (7.35), Icardi (7.31) and Perisic (7.15) are the best rated players for the Beneamata. While Atalanta’s best three is composed of Gosens (7.39), Gomez (7.33) and Ilicic (7.31).